New Cafe Retro is the modern style design with easy to use features. ABS body with sleek finish;toggle switches with indicator lights;temperature gauge;knob controlled commercial quality steaming and frothing with maxi cappuccino device. Easy to clean design includes a the removable tank with water level visible;pull out knock box and tray;simply wipe the sleek finish to clean. Adaptable for use with ground coffee or coffee serving espresso pods (ESE). 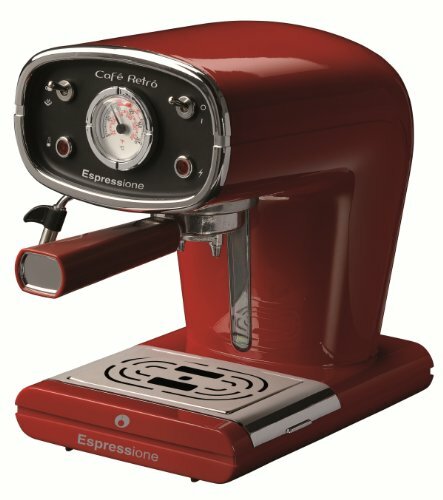 Great performing espresso machine in a Sporty Italian Red color with chrome accents. If you have any questions about this product by Espressione-DeLonghi of Italy, contact us by completing and submitting the form below. If you are looking for a specif part number, please include it with your message.